Something this trip has shown me is how quickly you become an “expert”. Only yesterday we were chewing our nails, worrying we were on the wrong train, heading the wrong way, sitting in the wrong seats and today…like we’d been doing it for years. Negotiating stations will take a little longer to master, I fear. Arty Amsterdam – Spot the disgruntled Farm Girl; there was no way those sitting on top of the letters were allowing her to join them! 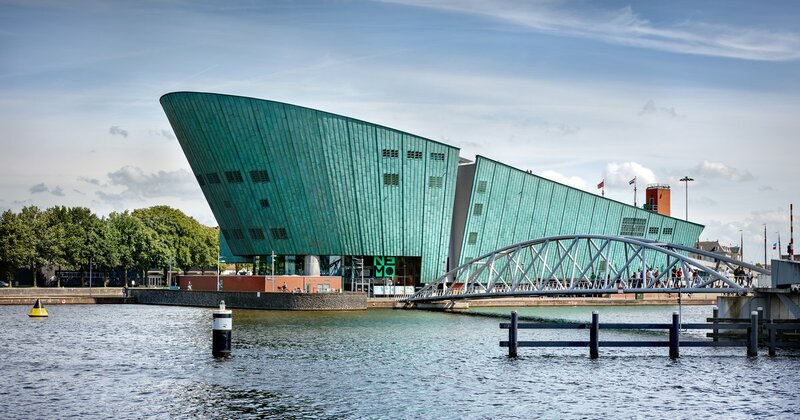 The Van Gogh Museum was on the original Homestead Must Do List, so we booked a fast track ticket for the following evening and were very happy we had. Despite large gaps in the presence of Van Gogh artwork (this has been spread all over the globe) it is incredibly well presented and provides a great insight into the artist’s character. We left as the techno dance party was beginning in the lobby, sure in the belief that Vincent would have loved, if not the crowd, definitely the unconventionality of it. We loved the gritty/affluent feel of the place; somewhere that has been at the centre of happenings for a long, long time. The Homestead resident Mechanical Engineer marveled at the wily Dutch problem solving designs. You can’t travel to The Netherlands and ignore clogs, windmills, or the humble bike! To access Anne Frank House you need to book a time slot online, something we had intended to do whilst still in London but never quite got around to. Eek! When we logged in to the site whilst in Bruges it was to discover not a time slot remained over the three days we were in the city. Thankfully we followed up the lady in the Information Centre’s advise to continue to check the website as tickets often become available, and managed to secure six on our final evening. To be in the Secret Annex, walk through the rooms, up that incredibly steep staircase, through the secret bookcase entrance, was a surreal experience for someone who had read first my Oma’s and then my own copy of the diary – the first book I ever purchased – ragged. Oddly, the most touching thing for me was the unintentional movie footage of Anne (she is picked up by the camera, watching a neighbour’s wedding from her family’s apartment balcony). She truly was just ordinary, everyday, slightly nosy girl. Then, in true Amsterdam many-faces fashion, we followed that visit up with a meal at the Amsterdam Hard Rock Cafe. Amsterdam is an awesome city! We were incredibly lucky in our choice of hotel (Hotel Alexander by Vondelpark) which was far enough away from the smoke and staggering tourists of Liberal Amsterdam to be comfortable, while not too out of the way to be inaccessible – and the staff were fantastic. Unable to purchase the much cheaper train tickets for our next adventure on-line as we didn’t have a dutch bank account, they happily did so from their own account (saving us about 300 Euro) and, even more wonderful, happily took the Princess’s excess-to-requirements suitcase and would not accept any form of payment. Interestingly, not long after our visit, The Bean Counter spotted this article in one of his favourite sources of Interesting Facts, which pretty much summed up our feelings: in it’s attempts to keep it’s head above the fiscal waters, Amsterdam may have created monster. I hope it manages to wrestle it back into it’s cage; liberal is fine and dandy, but always maintain your dignity. This entry was posted in The Grand Tour, Union Homestead and tagged Amsterdam, Anne Frank, families, Family, family visit, Hard Rock Cafe, Liberal, Tourism, whanau. Bookmark the permalink. Amsterdam is truly is an incredibly diverse city! Thanks for sharing! There are so many places I’d love to visit but Richard and I have been reading accounts like the one from the Guardian in your link and we’ve come to the conclusion that we will have to forego visiting some of them for the forseeable future or at least until some better system is in place. Poor Farm Girl! What a mean lot not letting her climb up on the letters! Having lived for a while near Fort William at the foot of Britain’s highest mountain, I can sympathise with the tourist dilemma. We even had a small tourist business but the tourists pottering about in the town and clogging up the roads while admiring the view were a pest. And it’s much worse there now. I, too, can sympathize with the tourist dilemma. Maine, the state I live in, is a vacation destination for much of the North East. And why not? It has the ocean with its beaches, rolling hills, lobster, blueberries, and many other delights. At one point, “Vacationland” was emblazoned on our cars’ license plates. Let’s just say it isn’t vacationland for the people who live here. Also, as a native Mainer, I must add that while tourism is all well and good, it’s no way to fund a state or a country. A few people—the owners of shops or restaurants—make decent money, but the rest of the workers don’t earn very much. Anyway…sounds like you had a lovely time in Amsterdam. Yes, yes! And it is great to see other places.